Next evolution in legendary VX product line garners Radio World International Best of Show Award in Radio Broadcast Solutions category at IBC 2018. CLEVELAND, OH – 8 October 2018 – The Telos Alliance®—leader in broadcast technology and parent company to Telos®, Omnia®, Axia®, 25-Seven®, Linear Acoustic®, and Minnetonka™—announced today that it has received the Future Radio World International Best of Show Award in the Radio Broadcast Solutions category for the Telos VX Enterprise & Prime+ Broadcast VoIP Phone Systems at IBC 2018. "We want to thank Future for the Radio World International Best of Show Award for VX Enterprise and Prime+," says Marty Sacks, VP of Sales, Support, and Marketing for the Telos Alliance. "This award is a testament to the fact that broadcasters are catching on to VoIP and realizing the immediate benefits of better call quality and huge cost savings over traditional phone systems. The addition of AES67 makes it that much easier to integrate your phone system into your network." Both these new VoIP phone solutions offer support for AES67, allowing broadcasters to integrate VX Enterprise or Prime+ into any AES67 environment, including an Axia Livewire® network. Livewire users have the added power of networking control (GPIO), advertising/discovery, and PAD throughout the network. Users will enjoy the best-sounding caller audio ever because both VX Enterprise and VX Prime+ include native support of G.722 HD Voice. Telos' 5th-generation Telos Adaptive Digital Hybrid supplies the clearest caller audio, while Smart AGC and Digital Dynamic EQ by Omnia assure call-to-call consistency from even the toughest cell phone caller. While traditional phone systems can be complicated, VX uses standard SIP protocol to take advantage of low-cost and high-reliability service offerings and simple setup via Ethernet cable. Broadcasters can save every month on traditional analog phone lines by upgrading to VoIP service, offering a significant return on investment. 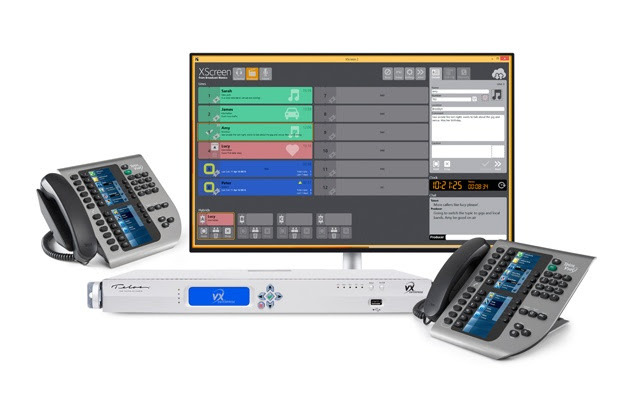 Shown here, the Telos VX Enterprise Broadcast VoIP Phone System, winner of the IBC 2018 Radio World International Best of Show Award, Radio Broadcast Solutions. For more information, please contact Krissy.Rushing@TelosAlliance.com.